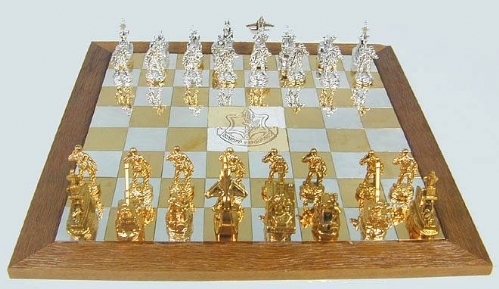 Large Artisan Sterling Silver IDF Chess Set A masterpiece unique artisan large 925 sterling silver (NOT silver plated) IDF (Israel Defense Force) chess set, Judaica. 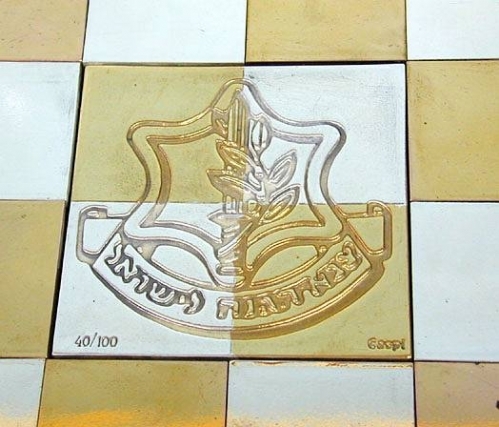 Comprised of 32 highly detailed and outstanding IDF related pieces representing the various corps in the Israeli defense forces, 16 made of sterling silver (for the white pieces) and 16 made of gilded sterling silver (for the black pieces). Measurements: Board: Length: 20.5in. / 52.07cm. Width: 20.5in. / 52.07cm. Height: 3.5in. / 8.9cm. Pawn height: 2.4in. / 6.1cm. King height: 3.5in. / 8.89cm. Weight: 6725gr. / 216.2oz. Marks: 925 for sterling silver.